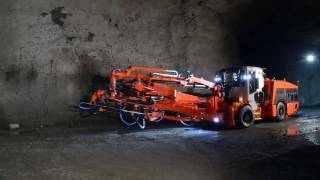 Sandvik DS411 is a rock reinforcement drill rig engineered to install the most common rock bolt types, in combination with steel wire meshes when required. The rock bolting process is completely mechanized and controlled by a single operator. Thank to the strong and reliable TBR60 boom, this bolter can install several rows of 1.5–3-meter (5–10ft) rockbolts from a single set-up.